Machu Picchu is the crown jewel of the Inca Empire. 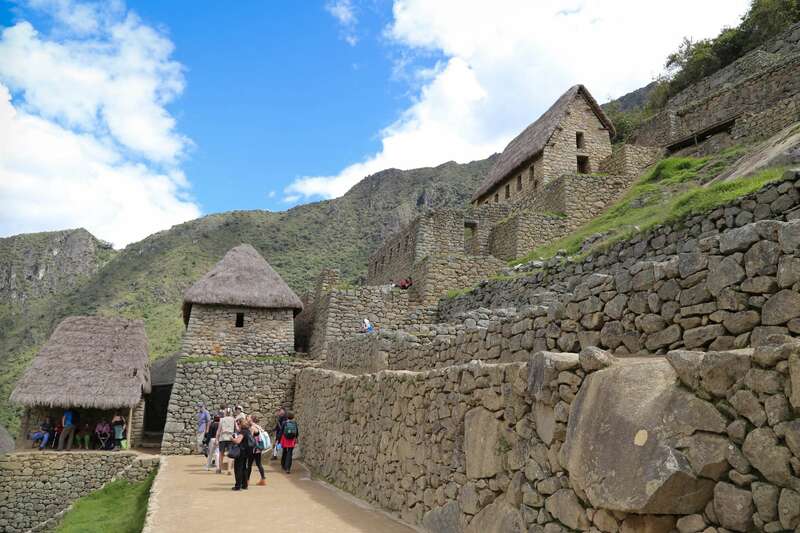 Hidden away in the Andes Mountains, it is the most popular visitor destination in Peru. This restored building shows how timbers and roofing material were secured and provided a dry space for people to live and to store food. 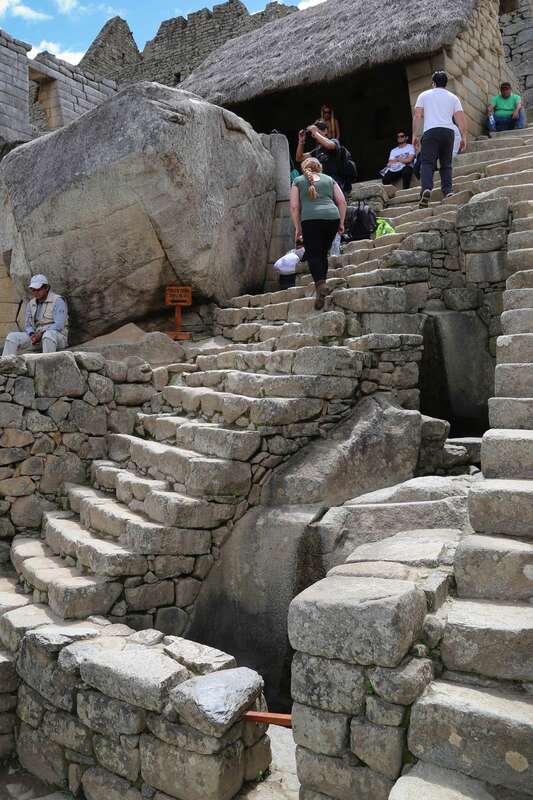 The Incas were master builders and used no mortar or cement to secure the massive boulders in place. Terraces secured buildings to hillsides provided a place to grow crops and to control rainfall. 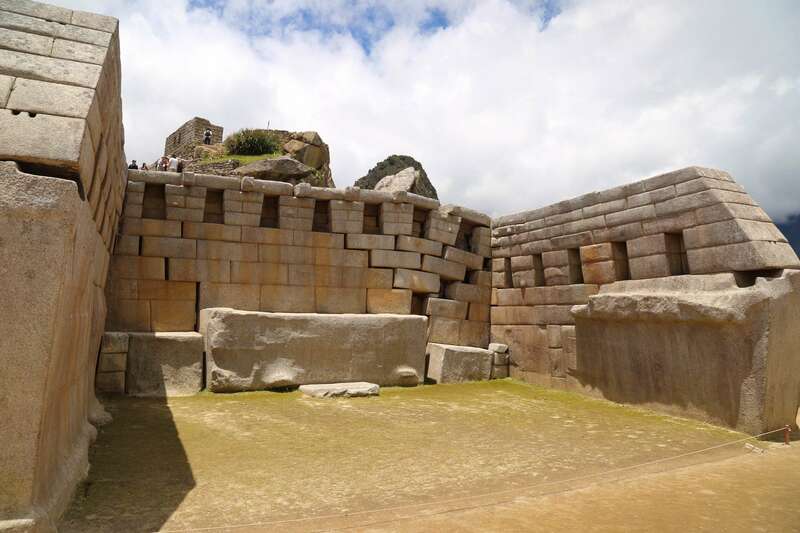 The pile of boulders in the center are remnants from the quarry of white granite used to build Machu Picchu. Researchers say it took nearly 100 years to build and it was in use for only about that long before it was abandoned and lost to obscurity for 400 years more. 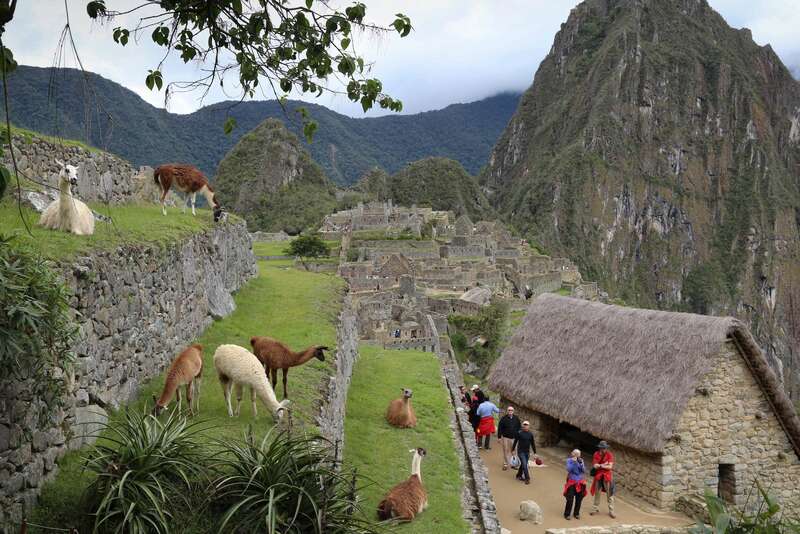 But in 1911, when American archeologist Hiram Bingham stumbled upon Machu Picchu, about 45 miles northwest of Cusco, Peru, he reintroduced to the world a magical place that grows increasingly popular with tourists from all over the globe. Machu Picchu sits on about five square miles at 8,000 feet above sea level. 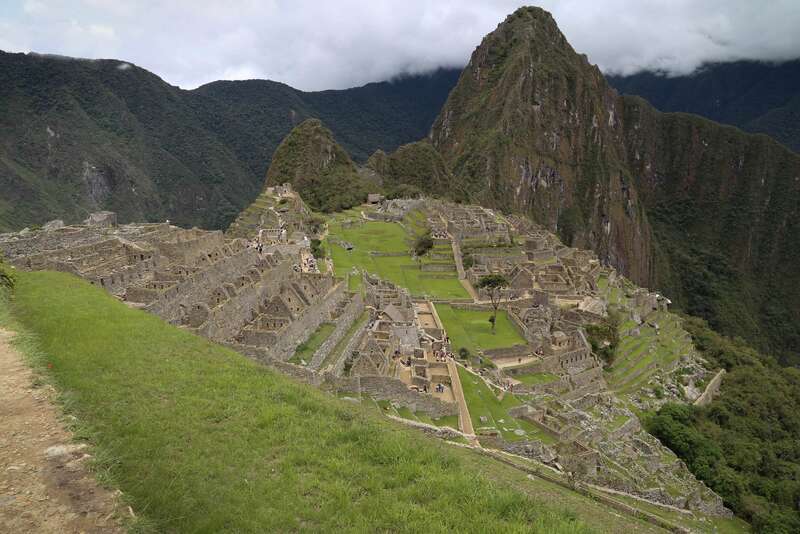 Some criticize the amount of restoration that has been done at Machu Picchu. There is a contrast with the Incas’ precision and the restorer’s handiwork. Why was Machu Picchu constructed nearly 8,000 feet above sea level? Was it a palace, a ceremonial or sacred site, or a home for priests and the ruling elite? Machu Picchu is constructed of hundreds of thousands of stones – some huge – but how did they quarry, move and shape them at a site that covers five square miles? Incas knew of the wheel but only used it for children’s toys and they lacked strong draft animals. 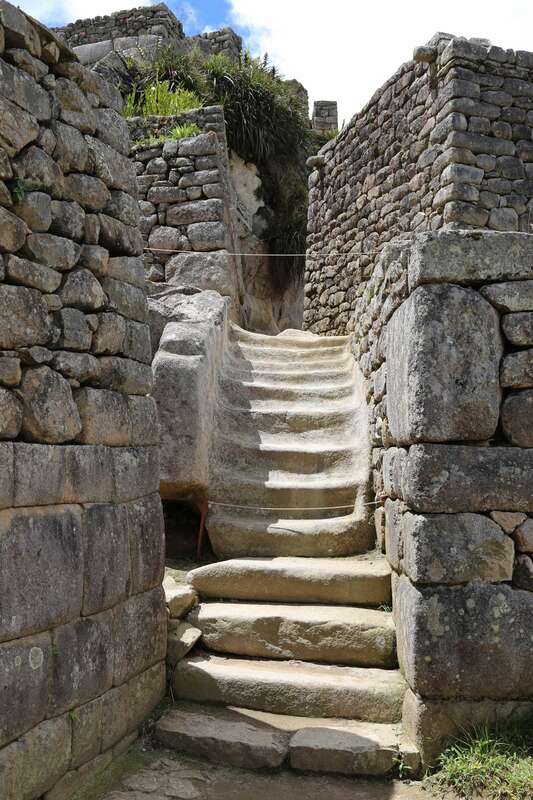 Nor did the Incas have metal tools to work and shape stones that comprise walls, buildings, supports and other structures. 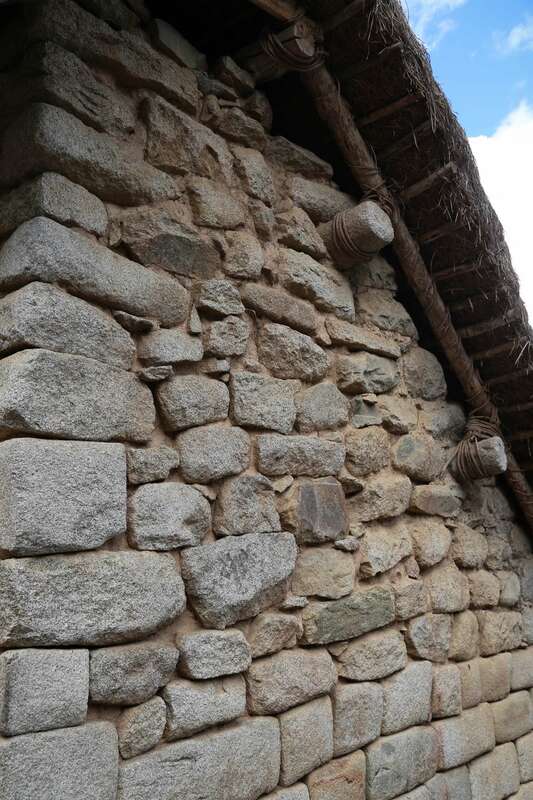 The precision of Inca stone work can be seen on the wall at the left, where to this day the fitting is so tight a knife blade cannot be inserted between stones, even after more than 500 years. 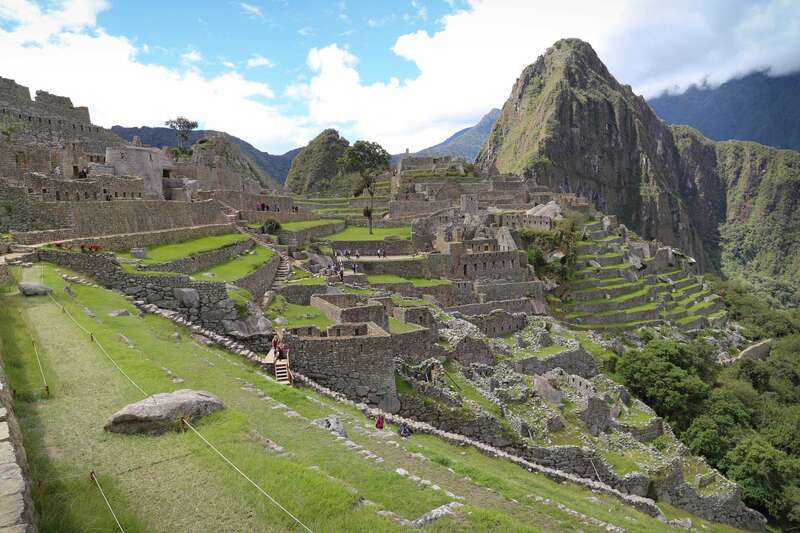 For a number of excellent reasons Machu Picchu has been designated a UNESCO World Heritage Site. 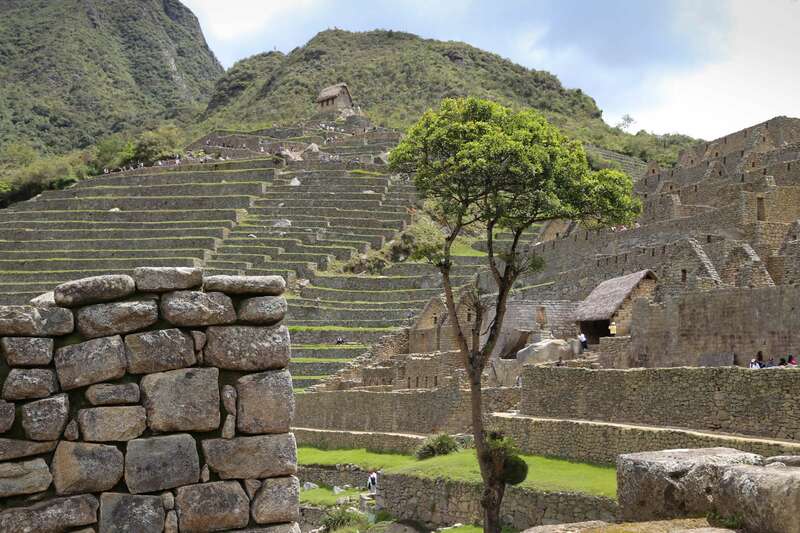 To answer some of these questions, it’s important to know something about Inca culture. In many respects, this civilization was highly advanced. They were outstanding engineers who built roadways (the empire totaled about 25,000 miles of roads), aqueducts, bridges, terraces, drainage systems and buildings. They were first-rate agronomists who developed a technique to freeze dry food. They also conducted agricultural experiments to produce the best adapted foods. Their knowledge of medicine enabled them to treat illnesses and injuries. And they were adroit at operating a centralized economic system that utilized complex accounting practices. At its height, the Inca Empire encompassed the largest area in all of Mesoamerica, stretching along the west coast of South America from present day Chile up to Colombia. There are about 600 terraces, each built by hand, more than 100 buildings, along with ramps and roads. Young Mountain rises up in the background. Machu Picchu is a place that is serene and also blends in with Nature. The most famous Inca ruler was Pachacuti (patch-uh-kootie), thought to mean, “He who overturned space and time.” Pachacuti lived from 1430 A.D. until about 1471 A.D. He rose to power when the Incas fought the Chanka, a neighboring society. Pachacuti’s father, then the Inca ruler, and Pachacuti’s older brother both fled the city as the Chanka approached for war. Pachacuti rallied his people and though greatly outnumbered, Pachacuti and his men triumphed. In recognition of his bravery and leadership his father designated Pachacuti the heir apparent instead of his older brother. 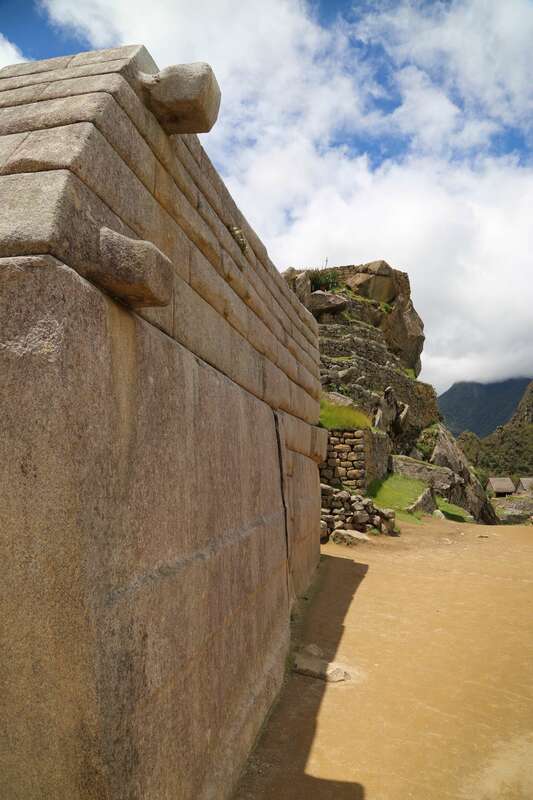 Most of Machu Picchu has been reconstructed; the difference between the stonework of the Incas and their modern-day relatives is easy to see, with the near-perfect stones on the bottom and the looser fit of the restored stones. The Incas fit stone precisely, but they had no metal tools. 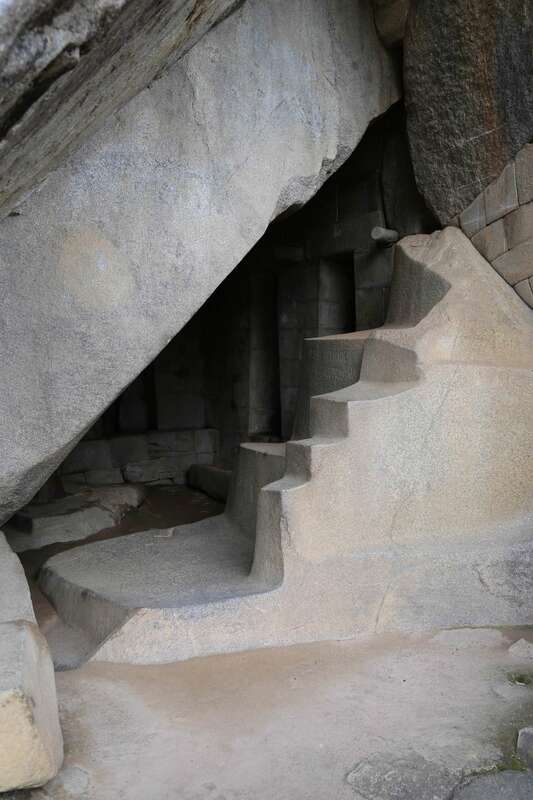 It is thought they used harder river rock from the Urubamba River to shape the stones and then a slurry mixture of sand and water to smooth and finish the white granite. Site restoration is behind the woman and to the left. The Urubamba River, 2,000 feet below Machu Picchu, and a headwater of the Amazon River, provided rocks to work Machu Picchu’s stones. From almost any angle or perspective, Machu Picchu amazes visitors with the accomplishments of the Inca builders. Pachacuti wasted little time cementing his position, elevating Inca society and expanding the empire. He set about rebuilding Cusco as both a symbol of the Incas and an imperial city. 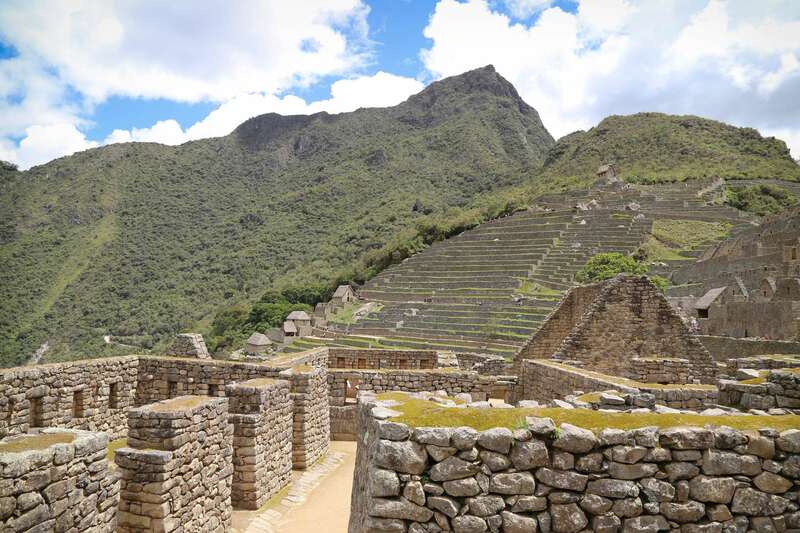 It is thought around 1450 A.D. he began construction at Machu Picchu. 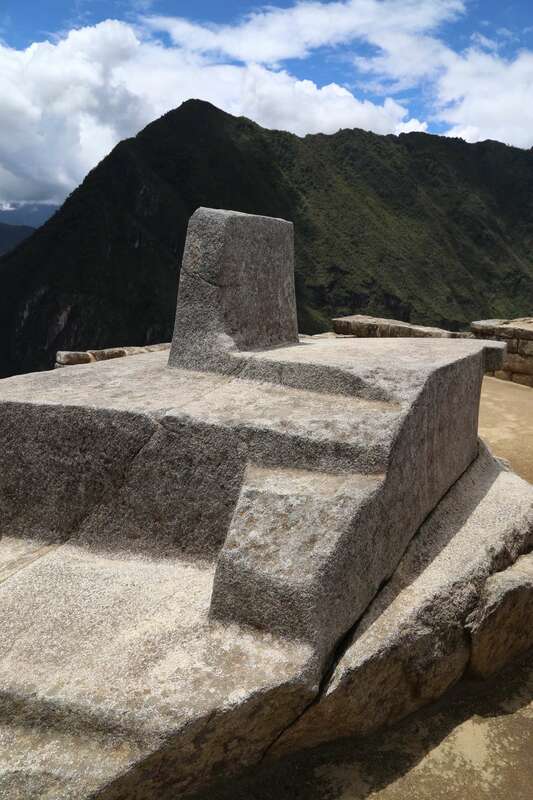 This may be the most significant stone at Machu Picchu. Known as the Intihuatana, its name is Quechua for “the tether of the sun.” The term refers to the theory that the stone was once used as an astronomical calendar. During spring and fall equinoxes, the sun casts virtually no shadow. Visitors peer into water-filled bowls, a type of simple observatory to see the sun and heavens. The Incas were knowledgeable about celestial and seasonal events and their relationship to daily life. Craftsmen at Machu Picchu used stones to carve stones. The stairs in the middle, one solid piece of rock, are a testament to their ability. There are a number of reasons Machu Picchu is impressive and for a number of reasons was named a UNESCO World Heritage Site in 1983. Start with the location. Peru’s Andes Mountain region is subject to earthquakes so a building or wall made of boulders and stones stacked on top of each other would be subject to falling apart in a temblor. The Incas were such masterful masons they shaped and fitted the stones so precisely that even to this day is it not possible to slip a knife blade between stones that have been piled on top of each other for well over 500 years. 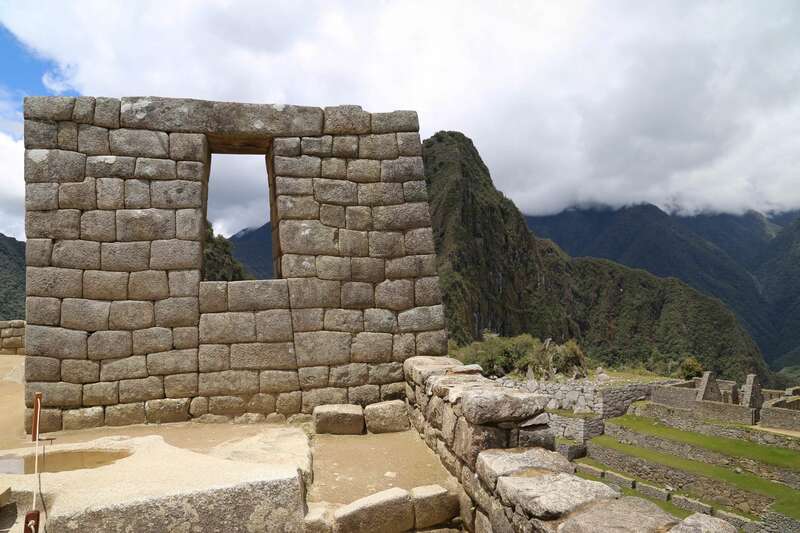 But, visitors have to look closely to find some of the original Inca stone work, as most of Machu Picchu has been rebuilt, in an effort to show the elements and grandeur of the site. 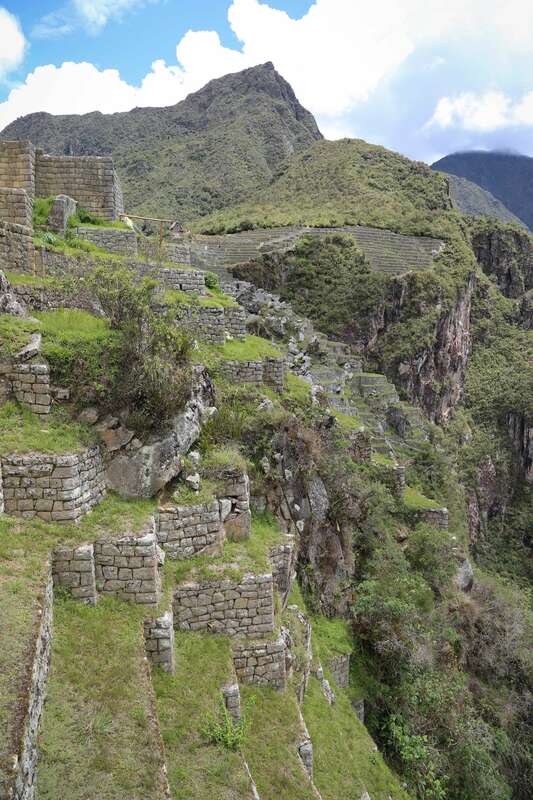 Using only hand labor, stones, and ingenuity, the Incas created a masterpiece at Machu Picchu. It might have been easier to build on a different site, but Pachacuti, the greatest Inca of all, wanted to make a statement. And he did. 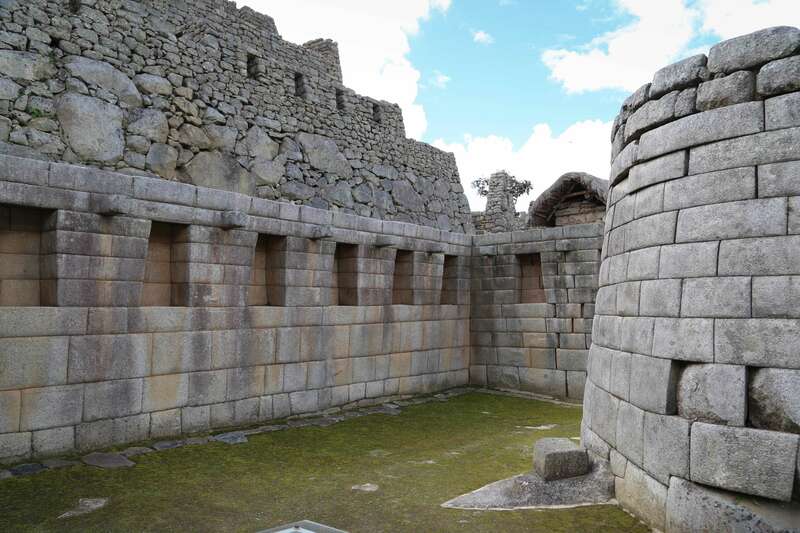 Another notable element of Inca design and construction is that walls tilt inward at an angle of about five degrees. This might not seem like much but the reinforcing aspect of the lean actually provides added strength to the walls. And windows are not square but trapezoidal, and along with the slight inward lean, provide greater stability in the event of an earthquake. A slight uphill lean of the terraces provides added stability that helps anchor them to the steep hillsides. 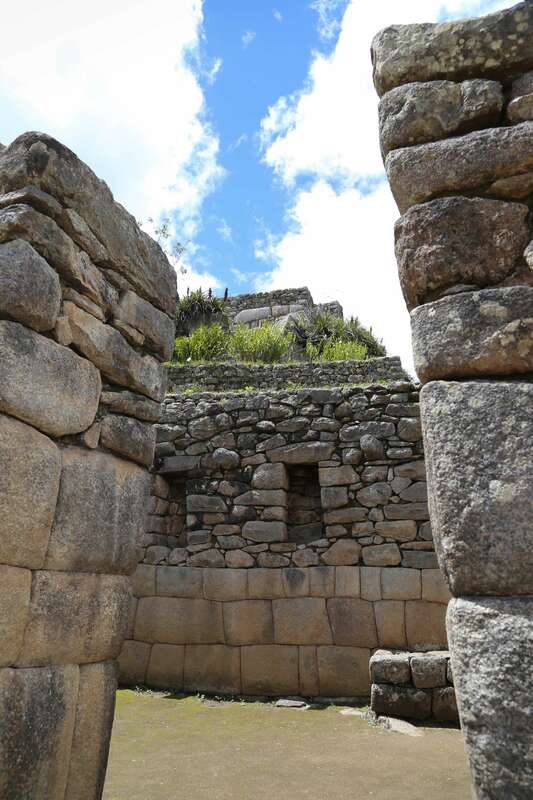 The Incas knew they lived in an earthquake-prone area but solved the construction problem by giving their building a slight inward lean of about five degrees, providing walls and buildings added stability. The trapezoid shape of the windows also made them more stable in earthquakes. Machu Picchu is in an extreme location. Beyond the high elevation, hillsides are very steep. 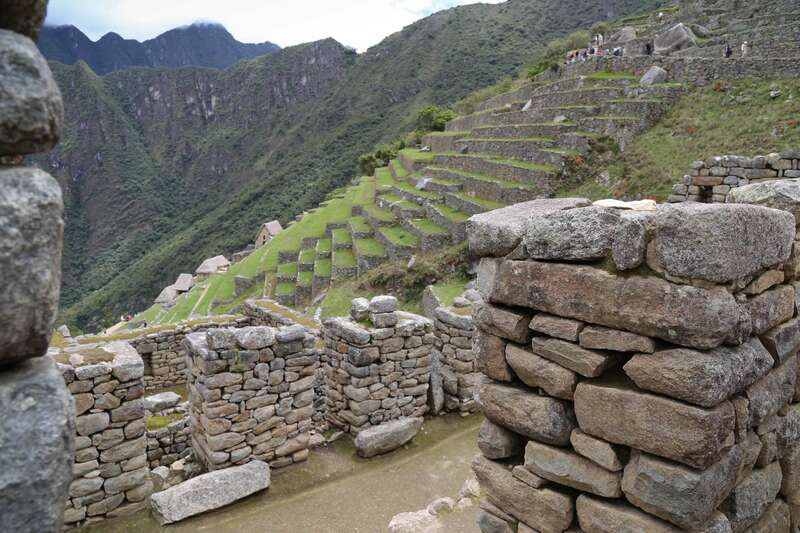 To solve this problem, the Incas employed a system of terraces, approximately 600 in all, to secure the structures and roadways to the hillsides. Terraces are one of the major features at Machu Picchu. They act as anchors to the hilldsides, provide an area for raising food crops and are ideal for handling the 80 inches of rainfall and runoff the area receives every year. The scale of Machu Picchu is breathtaking and given its age, it is an engineering marvel of ramps, terraces and buildings. Llamas are a relatively new addition to Machu Picchu, but they do an excellent job of keeping down grass on the terraces and other areas. The terraces are engineering marvels by themselves. Measuring about seven feet high and ten feet wide. The walls lean uphill just a bit. Inside there is a bottom layer of rocks, then stones, followed by gravel, with sand and finally dirt on top. This design accomplishes at least three important functions. First, the terraces act like claws, gripping the hillsides. The uphill lean provides strength and stability and the layers of material inside the terraces provide excellent drainage. This is important because up to 80 inches of rain falls each year at Machu Picchu. Researchers believe it took thousands of workers to construct Machu Picchu, but less than 1,000 people lived there. 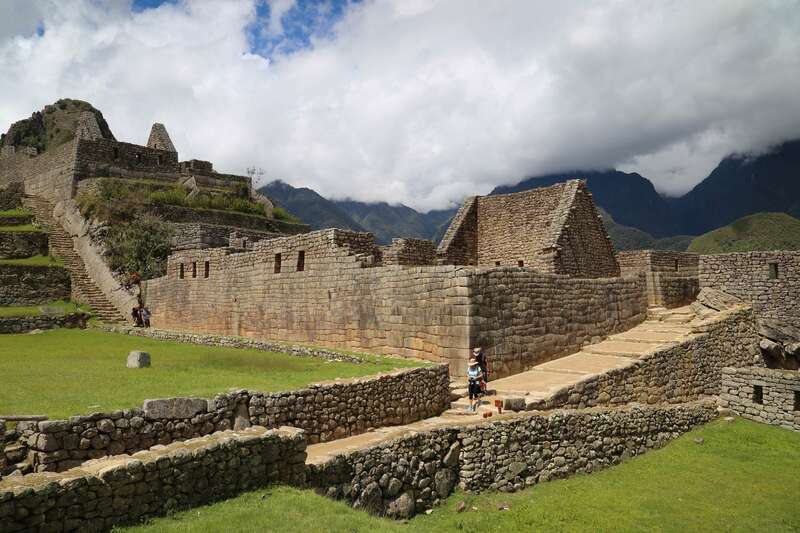 The rainfall issue points to another challenge the Incas overcame. While visitors only see the remaining buildings, terraces and structures, it is below ground where critical innovations have been installed. 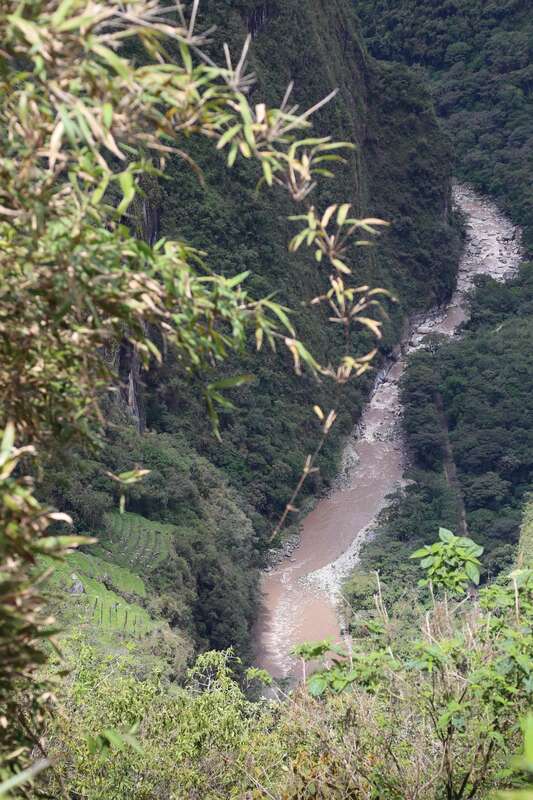 Hydrologists and scientists marvel at the expertise the Incas used to move water so it did not pool or cause erosion. 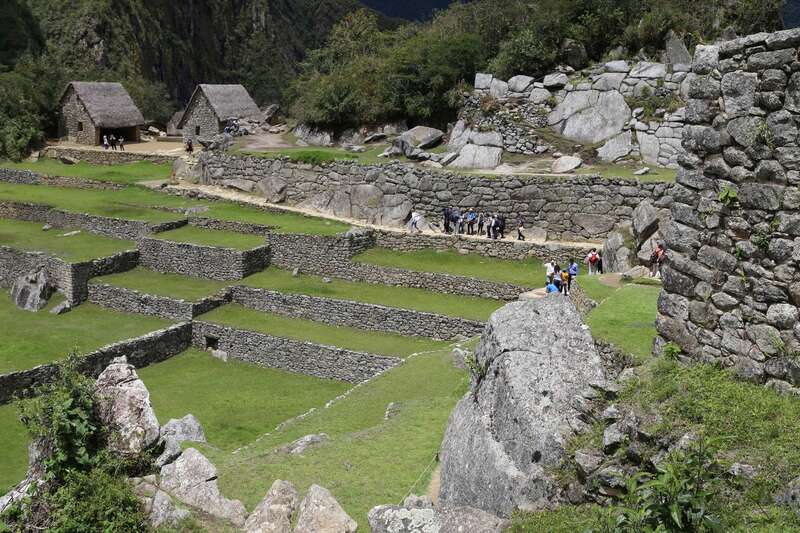 Only a small part of Machu Picchu is original — most of the site has or is being restored. But parts, like this wall, show the precision of the stonework. And with their knowledge of hydrology, the Incas were able to construct 16 fountains that provided a constant source of fresh water. Some of these fountains work to this day. 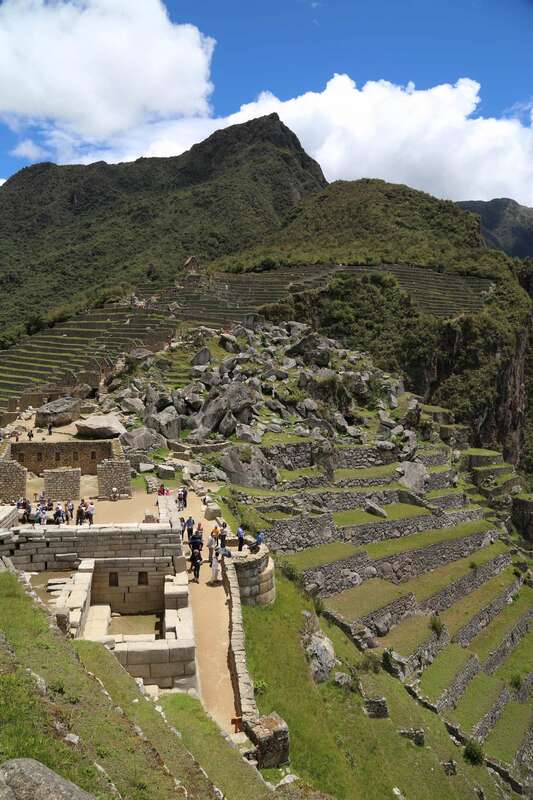 Engineering, construction and hydrology were just a few of the highly developed skills the Incas employed when building Machu Picchu. 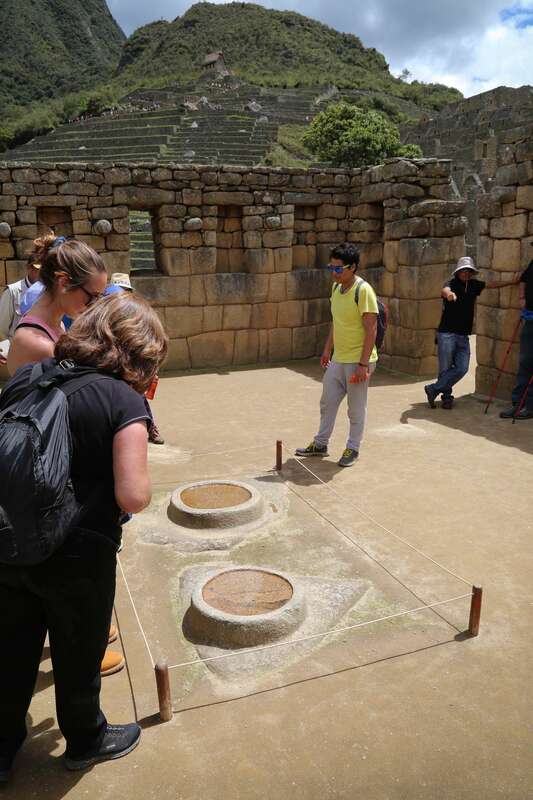 Here, center right, a small fountain still flows, one of 16 at Machu Picchu that provided water to those who lived here. 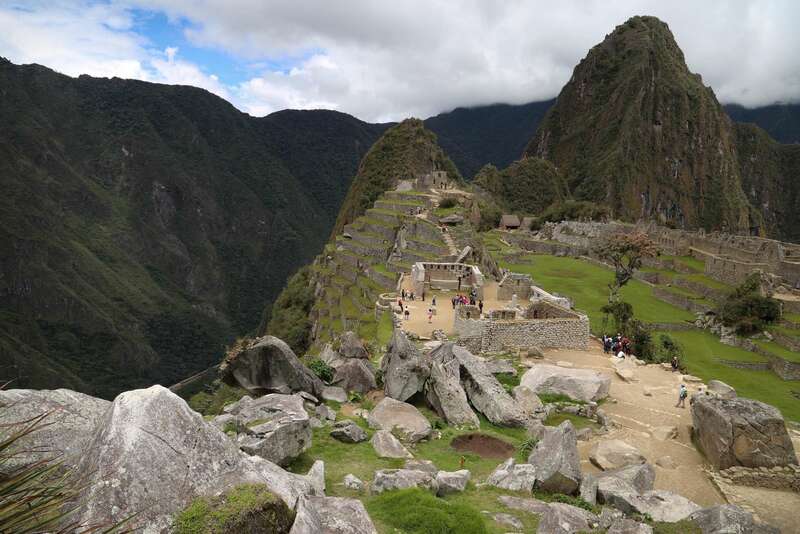 Another reason Machu Picchu was an excellent site was the plentiful supply of white granite available. Being able to procure rock on site meant it did not have to be hauled up the mountain, a near-impossible task, given the vertiginous aspect of the location and lack of transportation options. White granite, an excellent building material and plentiful at Machu Picchu, was quarried on site, as evidenced by the boulders left behind. 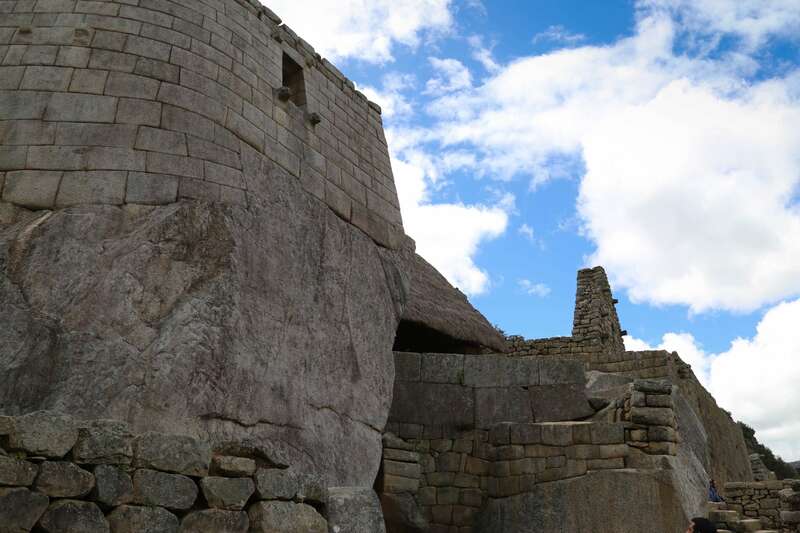 The Incas solved another major construction hurdle – how to shape and finish the stones that would become Machu Picchu’s walls, terraces and buildings. The simple answer was river rocks, found about 2,000 feet below Machu Picchu in the Rio Urubamba. River rocks are a harder stone than white granite and they could shape and wear down the granite. To make the surfaces and edges smooth and straight it is thought that a sand and slurry mixture was used to polish and finish the granite. Some of the stones have holdfasts and indentions that were thought to be a place to grab and move the stones. It took determination and skill to fashion these stairs building elements out of rock, using only other rocks. 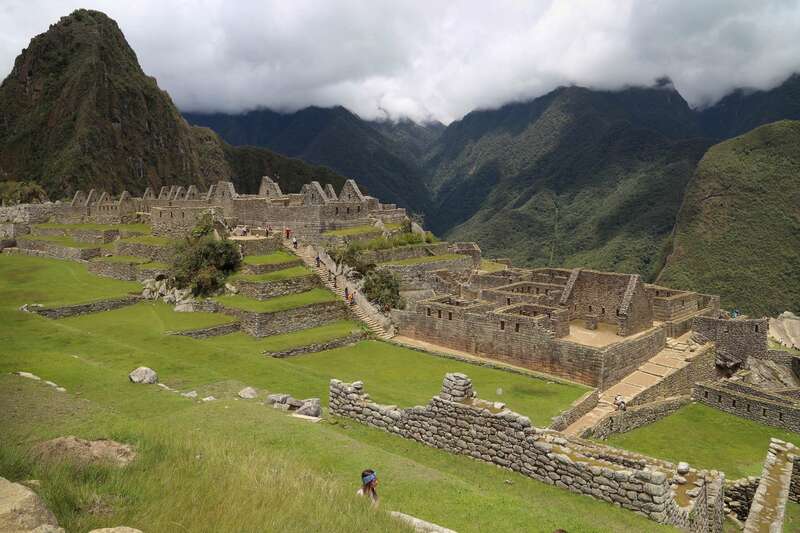 What was it like for those fortunate enough to live at Machu Picchu? Even though Machu Picchu is hidden high in the mountain mist, it was not a place that would be inhabited for long. There is speculation disease decimated the population of Machu Picchu, brought in with the Spanish who had come to plunder gold and riches. 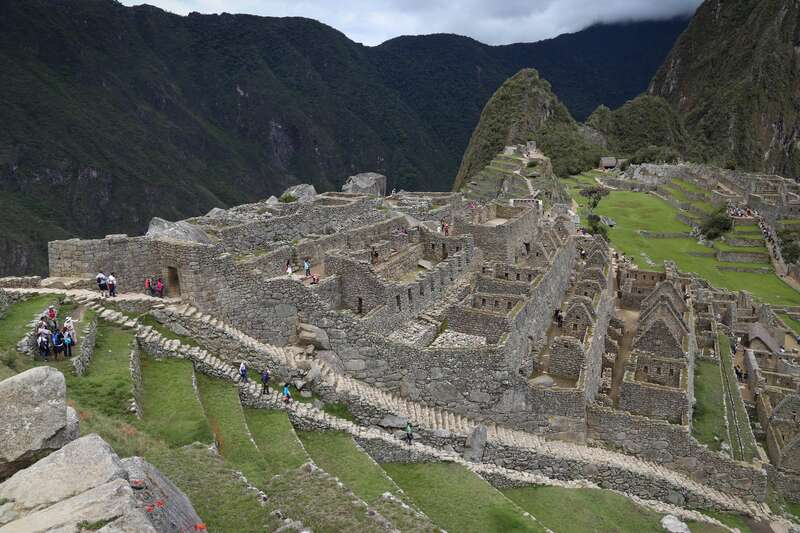 Researchers have theorized that less than 1,000 people actually lived at Machu Picchu. The scale of Machu Picchu is huge, yet at the same time it blends harmoniously into the hillsides and mountains. 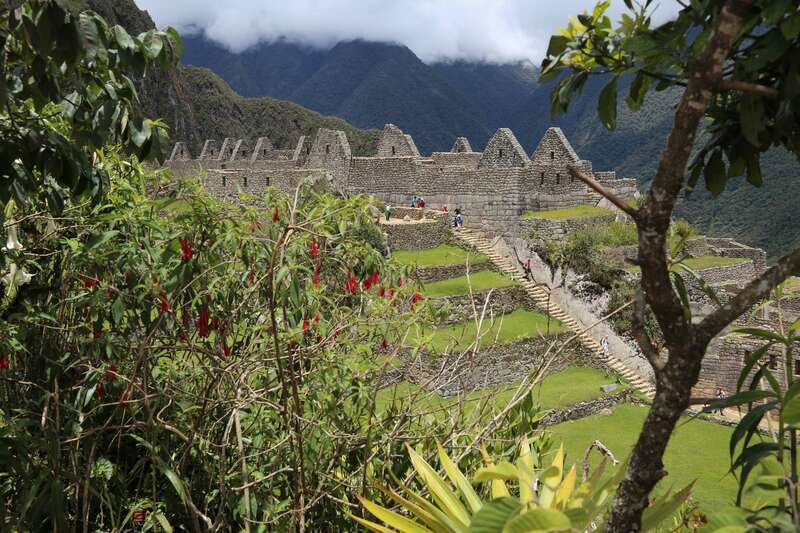 Machu Picchu’s remoteness was likely its salvation from Spanish gold thieves. The rain, climate and jungle quickly covered over the site and its location would have been a daunting journey for any explorer. Undisturbed, Machu Picchu sat for about 400 years, until Bingham came along. There is evidence others knew about Machu Picchu and had explored it before Bingham, but he is the one credited with spreading the news. From a distance and with foliage in the foreground, Machu Picchu and Nature are one and the same. 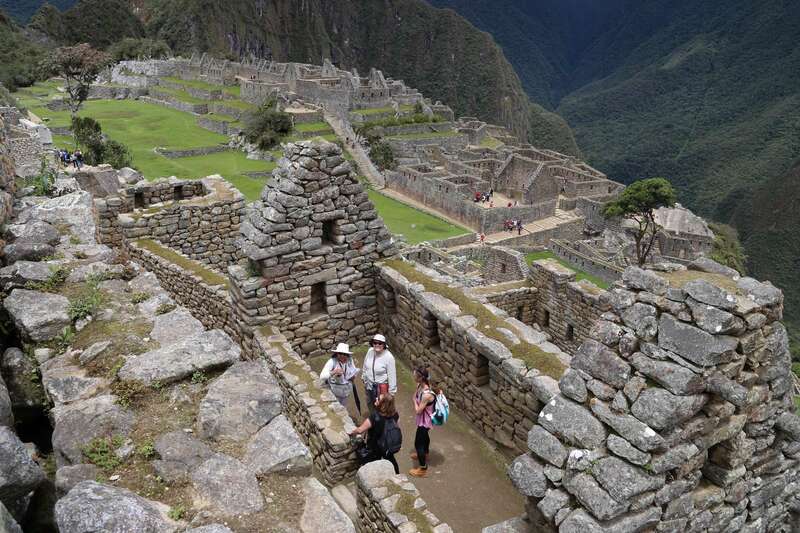 Visitors come from all over the world to see Machu Picchu and appreciate the accomplishments of the Inca builders. On many days Machu Picchu is shrouded in clouds but when the sun peeks out, there’s an added dimension to its beauty. Today Machu Picchu is a great source of pride to Peru and a place of wondrous beauty to all who come to visit. 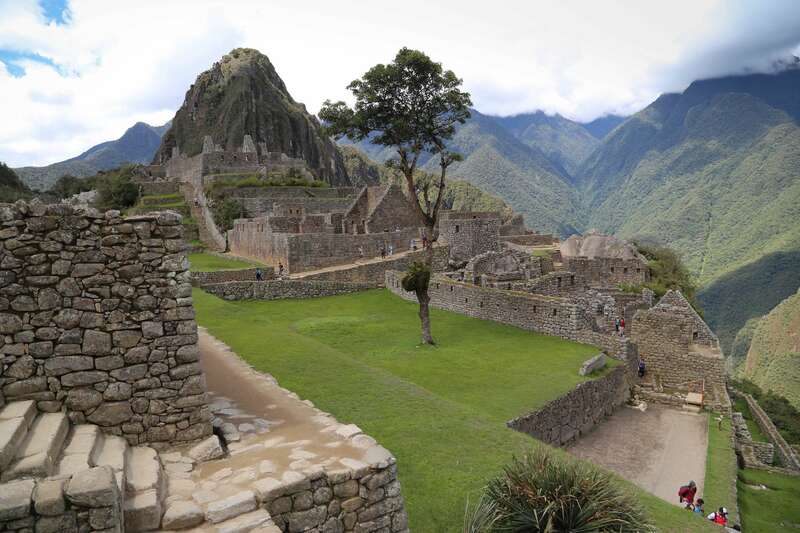 Machu Picchu is grand in scale yet blends harmoniously with the surrounding mountains and land. Any traveler wanting to see one of the world’s great places would do well to add Machu Picchu to their wish list of marvels to visit. 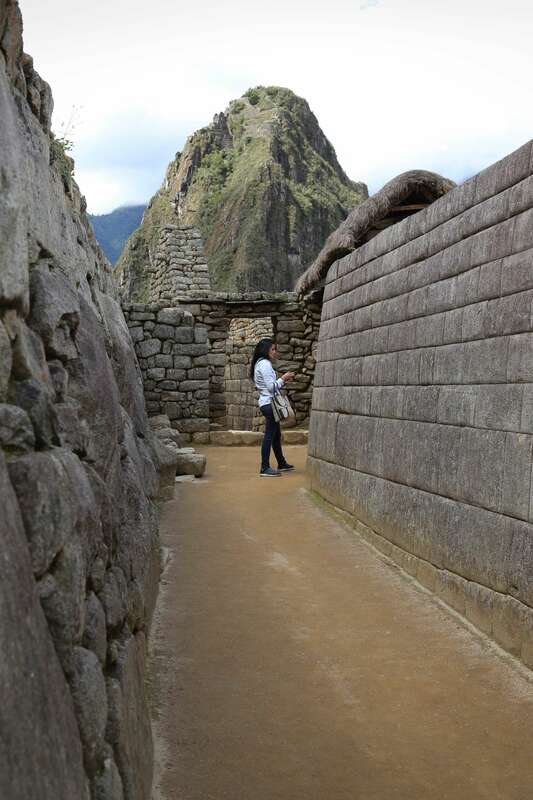 This entry was tagged A City A Month, Inca, Machu Picchu, Michael Kardos, Peru, travel. Bookmark the permalink.